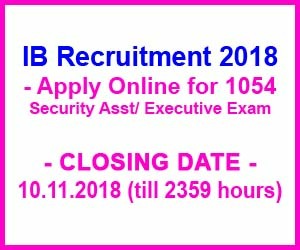 Online applications are invited from Indian nationals for direct recruitment to the post of Security Assistant (Executive) in the following Subsidiary Intelligence Bureau, Ministry of Home Affairs, Govt. of India. Applicants are advised to go through all parameters under different paras and sub-paras mentioned below and satisfy themselves about their eligibility in terms of age limit, essential qualifications, etc. for the post before applying. Candidates fulfilling eligibility criteria as mentioned below may apply ONLINE through MHA’s website (www.mha.gov.in) or NCS Portal (www.ncs.gov.in) only. Essential : (i) Matriculation (10th class pass) or equivalent from a recognized Board of Education, and (ii) Knowledge of any one of the local language/dialect mentioned in Table ‘A’ above against each SIB/Centre of examination. Rs. 50/- (Rupees Fifty Only). Only male candidates belonging to General and OBC category are required to pay the fee. All SC/ST, Ex-servicemen* & female candidates are exempted from payment of examination fee. The application portal will be operational from 20.10.2018 to 10.11.2018 till 2359 hours. Registration done, prior to 20.10.2018 and after 10.11.2018, will not be accepted. Candidates are advised to register well in time, since the application portal witnesses a surge in number of application during the run up to the closing date. The closing date for receipt of online application will not be extended under any circumstances. Candidates are advised to submit only one application. Submission of multiple applications may result in cancellation of applications altogether. Before submitting the online application, the candidates MUST preview the application to ensure that they have provided correct information, particularly the email id & uploaded correct photograph & signature. It must also be ensured that the photograph & signature are visible & not hazy/blurred, otherwise the photograph & signature should be uploaded again or the page should be reloaded or refreshed. The online application should be submitted only after ensuring that the information/photograph/signature is correct. The candidate should note down and retain ‘Registration-ID’ & ‘Password’ provided to them while making registration which would be required later. They should also note down their roll number (as and when allotted) for future reference. Candidate should take printout of the registration slip/application form for future reference. This printout is NOT required to be submitted to this office at any stage. The registration becomes complete only after the photograph & signature are uploaded by the candidate. Candidates are advised to ensure that e-mail addresses ending with @nic.in/gov.in are directed to their inbox & not to spam folder or any other folder. They may also check the spam folder for mails sent from the helpdesk e-mail i.e. helpdesk.bharti@nic.in from time to time. The candidates should take printout of the Challan Form, if required. The candidates must also furnish one mobile number for receiving SMS alerts related to the exam. This office will not be responsible for bouncing of any e-mail or malfunctioning/change of the mobile phone number of the candidate. Candidates are also advised in their own interest to keep checking their email (inbox as well as spam folder) and the website of MHA from time to time for updates related to the recruitment process. Candidates are requested to make sufficient number of passport size coloured photographs (identical to the one uploaded) and carry identity proof in original such as Voter Card, Driving License, Aadhar Card, PAN Card, Identity Card issued by University/College etc. to the examination centre, failing which they shall not be allowed to appear for the examination. The photographs would be required at subsequent stages of recruitment process and pasting/providing a photograph different from the one uploaded may result in cancellation of candidature.